The American muscle car began, not in the factories of the Big Three automakers, but in the garages and dealerships of a Detroit subculture bent on making the hottest, highest-performance cars on the street. American Muscle Supercars tells the story of these tuner/builders and the supercars they unleashed on the American scene. It all begins with Michigan’s Royal Pontiac dealership, and the souped-up Royal Pontiac Bobcats they built and sold to drag racers, starting a thrill that’s never faded. From those Royal Pontiac tuner cars to the new Boss 302 Mustang built by Steve Saleen, this gorgeously illustrated book chronicles the outsize contribution of the tuner/builder to American automotive history. Author-photographer David Newhardt profiles the tuner/builders who have dominated American performance--names like Mr. Norm’s Grand Spaulding Dodge, Nickey Chevrolet, Don Yenko, Carroll Shelby, George Hurst, and Baldwin-Motion. And he focuses on the tuners who continue to lead the way, builders such as Steve Saleen, Calloway, and SLP, whose vehicles are the fastest ever built. 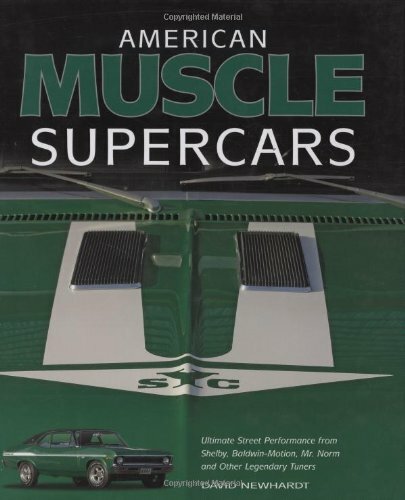 From the oldest of these muscle tuners, commanding top dollar at today’s classic-car auctions, to the latest attempts by Ford and Chrysler to get into the game with their SVT and SRT divisions, this book gives readers a full and fascinating look at American high-performance in its purest form.